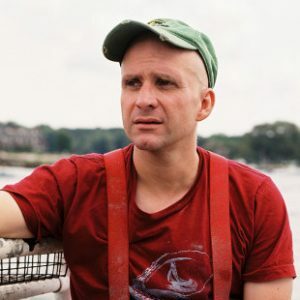 Bren Smith is the owner of Thimble Island Ocean Farm and founder/executive director of GreenWave. A commercial fisherman since the age of 14, Smith pioneered the development of restorative 3D ocean farming. His work has been profiled by CNN, Google Food, The New Yorker, and Bon Appetit. His writing has appeared in The New York Times and National Geographic. In 2015 Smith was the winner of the Buckminster Fuller Challenge for ecological design and the Clinton Global Initiative Award for ocean innovation. In 2013 he was chosen as one of six annual “Ocean Heroes” by Oceana and as “Ocean Entrepreneur” of the year by the Future of Fish. He is an Ashoka and Echoing Green Fellow. Smith’s visionary farming model is designed to restore ocean ecosystems, mitigate climate change, create jobs for fishermen, and ensure healthy, local food for communities.